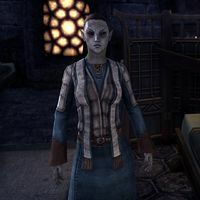 Aamela Rethandus is a Dunmer mage who resides in Selfora. She can be found at the upper floor of the Selfora Inn, treating Nilus Othran and Vivul Redoril. During the unrest in the town, you can help her heal the wounded citizens by gathering healing supplies from around the town. When you walk by her before starting the related quest, she will say: "How can I work in these conditions? I'm a healer, not a miracle worker!" "Hello, traveler. I'm Selfora's healer. Not that it means much now. This disaster has left me short on supplies. All I've got left are bloody rags and soothing words." "Almost everything: herbs, poultices, bandages. We weren't prepared for this." Where can I get these things? "There are supplies scattered throughout Selfora." Don't worry, I'll find the supplies. "Were you able to find any supplies?" "Thank the Three! And thank you, friend. Now I can do something to help these injured people." If you visit her at the Selfora Inn after saving Selfora, she will thank you once more, "Thanks again for bringing me those supplies." This page was last modified on 30 July 2018, at 18:50.